The Legal Genealogist knows already yet. You’re tired of hearing it. To understand the records, we must understand the law, in the time and at the place where the records were created. So here’s a little bit of help, with a kind of law we as genealogists often need to look at — but rarely do. It’s constitutional law — all those early colonial charters and state constitutions that have long since faded into legal history but that inform and explain the records we as family historians work with and need to understand. And there are readily-available resources to help you find that early constitutional law so you can apply it to your own research. In the second session of the 59th Congress, the House of Representatives published a report as Document 357, or H.Doc. 357 for short. It was printed in the early 1900s in that great big set of government documents known as the United States Serial Set. And these seven volumes pull together in one handy reference just about everything you might need to know about the early fundamental documents of American law. Except, of course, for the minor little detail that most of us don’t have all of the thousands and thousands of volumes of the U.S. Serial Set on our bookshelves. But we can all have these seven volumes at our fingertips. At Google Books (http://books.google.com/, you can find the volumes quickly by entering Francis Newton Thorpe Federal and State Constitutions in the search box. But the first results are current printed volumes you can’t read online, so use the Search Tools drop down menu, then change the Any Books option to Free Google eBooks. 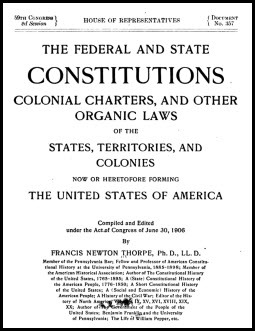 At Internet Archive (https://archive.org/), the volumes can be found by using the Advanced Search box, and entering “Federal and State Constitutions” in the Title field and “Francis Newton Thorpe” in the Creator field. And at HathiTrust (http://www.hathitrust.org/), click on the Catalog tab of the search box, then choose Advanced catalog search, enter “Francis Newton Thorpe” in the Author field and “Federal and State Constitutions” in the Title field. So go ahead… take a walk through your state’s early constitutional law. It’s easy, when you know where the path is. Love the title! And love using the Congressional records for finding family! Thanks for more bread crumbs to help us in our early research. I enjoy your blog and also your wit. Thanks for the kind words, Darlene. Much appreciated! Now this is so serendipitous, Judy. I just watched today’s Legacy webinar with J. Mark Lowe on Researching Your Tennessee Ancestors. Lots to understand re knowing which parts were under which jurisdiction – absolutely essential!! Federal? Sometimes. KY? NC? Sometimes. How do you know WHERE to look, if you don’t know exactly WHEN? Fascinating stuff. Merci! Mark is an absolute master of research in those parts, Celia, and I know the guidance he provides will keep you on the straight and narrow. But remember that you can always follow the when-and-where: there will be specific end-dates when one jurisdiction (VA, for example) left off and another began. BUT, I did NOT know about THIS collection by Francis Newton Thorpe. BTW: Just an interesting incidental…my grandfather’s name was Francis Newton. His sister Helen was our family historian until she passed on. I wonder if there’s any connection somewhere in our trees? It’d definitely be interesting if there was a connection!